Run to PONY land. Fairy, Golden Arrow, Palomino, Legend Hearth, Blacky, Silver Dawn, Avalanche, Dark Star, Blue Knight and Wind Catcher await you. Ten beautiful ponies on the magic pasture. Dress up all of them! You can choose among cute ribbons, lovely hairstyles, long or shorter tails, magic horns, fashionable necklaces, chic leg covers and do not forget to add stylish shoes. 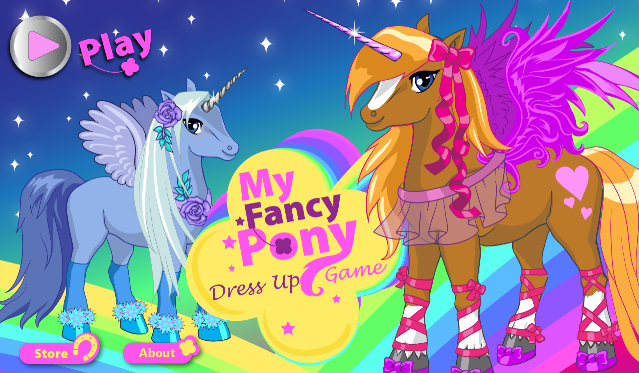 The mysterious ponies can fly using colorful wings, fine-tune your favourite pony with one pair of them. Every happy pony live in the charished landscape. Will it be a meadow, a beloved paddock, a snowy scenery or an edge of the forest in the sunset?